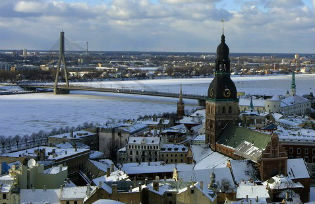 Latvia was severely hit by the Global Crisis yet its adjustment has been remarkable. Four years after the hit it has one of the highest growth rates in Europe, its euro-peg has held, and the fiscal and current accounts are close to balance. In 2008 Latvia was widely seen as an economic basket case, a textbook example of a boom turned to bust. From 2005 to 2007 average annual growth had exceeded 10% and the current-account deficit had increased to more than 20% of GDP. By early 2008 however, the boom had come to an end and, by the end of 2008, output was down by 10% from its peak, the fiscal deficit was shooting up, capital was leaving the country, and reserves were rapidly decreasing. The treatment seemed straightforward; a sharp nominal depreciation together with a steady fiscal consolidation. The Latvian government however, wanted to keep its currency peg, partly because of a commitment to eventually enter the Eurozone, partly because of the fear of immediate balance-sheet effects of devaluation on domestic loans, 90% of which were denominated in euros. And it believed that credibility required strong frontloading of the fiscal adjustment. Many, including me, believed that keeping the peg was likely to be a recipe for disaster or for a long and painful adjustment at best. More likely, the peg would eventually be abandoned when failure became obvious. Nevertheless, given the strong commitment of both Latvia and its EU partners, the IMF went ahead with a program which kept the peg and included a strongly-frontloaded fiscal adjustment. Four years later, Latvia has one of the highest growth rates in Europe, the peg has held, and the fiscal and current accounts are close to balance. The mechanics of adjustment have been straightforward; a further sharp decrease in output was followed by increases in competitiveness due initially to decreases in wages but increasingly due to productivity gains. Growth has come initially from external demand but is coming increasingly from domestic demand. Unless Europe has a meltdown, growth should continue (Griffiths 2011). Is it a success? The economic and social cost of adjustment has been substantial. Output further contracted by 16% in 2009 and is still 15% below its 2007 peak. Unemployment increased to more than 20% and still stands at 16% today, far higher than any reasonable estimate of the natural rate. Was there another, less costly, way of adjusting through floating and a slower fiscal consolidation? The truth is we shall never know. What is true though is that the adjustment looks likely to succeed under the peg, the economy is growing, and there is optimism in the air—a feeling quite unusual in Europe these days. This surely satisfies some definition of success. Why has it worked? Preparing for the conference I just attended in Riga in which we tried to draw lessons, and reading the evidence, I could think of seven reasons (at the conference, some, including the Prime Minister, had other lists. The reasons were more general; for example, ownership of the program by the Latvians, a clear exit strategy, namely the promise of entry into the Eurozone. My list is more prosaic, closer to an analysis of the plumbing, of each of the parts of the adjustment mechanism). 1. The adjustment was preceded by an unusually strong boom, so there was wide acceptance among the public that part of the downward adjustment was a return to normal. Some of the tough measures were seen as undoing the excesses of the past, for example the very large increases in nominal wages during the boom. 2. There was support for fiscal consolidation, and the acceptance of pain. Parties which argue for stronger fiscal austerity often did better than the others at the polls. Pedagogy, a factor emphasised by the Prime Minister (in his book with Anders Åslund (2011), which gives a detailed account of the crisis and of the adjustment) was surely important. But historical reasons, including the painful transition from central planning in the 1990s, surely played an important role. The Latvians could take the pain. 3. Wages were flexible, at least relative to the generic European labour market. The initial adjustment came with a dramatic reduction in public sector wages, and thus a direct improvement in the fiscal position. Together with unemployment, lower public sector wages put pressure on private sector wages to adjust. A note of caution is needed here however. Private sector wages, which are the wages which matter for competitiveness, have adjusted much less than public sector wages (by how much is a matter of some disagreement (Krugman 2012)). Indeed, I worry that nominal wages have started to increase, while more adjustment still has to come to maintain current account balance as output recovers. One has to hope that increases in productivity will do the trick. This takes me to the next point. 4. There was—and, looking forward, there still is—substantial room for productivity increases. Latvia has income per capita of half the EU average. Being far behind the technology frontier, it has a lot of room for catch up. 5. Latvia is a small, open economy—although less so than its Baltic neighbours. With exports around 50% of GDP, improvements in competitiveness (Wren-Lewis 2012) can have large effects on both imports and exports, and in turn on GDP. 6. Public debt was very low to start, less than 10% of GDP. Even today, public debt remains around 40% of GDP. This more or less eliminated foreign investors’ worries about default on sovereign debt, and allowed for a quicker return of Latvia to international financial markets. 7. The Latvian financial system was largely composed of relatively friendly foreign banks—better than unfriendly foreign banks, or friendly but weak domestic banks. For the most part, the Swedish banks recapitalised their banks and maintained their credit lines to the Latvian subsidiaries, reducing the intensity of the sudden stop and of the credit squeeze. Latvian policymakers would surely want me to add yet another reason—the strong frontloading of fiscal consolidation. Over the first two years of the program, the cyclically adjusted primary balance was increased by 11% of GDP. I am not sure. Growth was negative and large in 2009. Whether a slower adjustment would have led to less of an overall output loss just cannot be assessed. But I still draw two conclusions from what happened. While the decrease in output was dramatic, the recovery has been relatively more V-shaped than I expected, although I still worry about the effects of long-term unemployment. And the Latvian experience makes a strong political case for taking into account adjustment fatigue. While the large initial budget cuts went through relatively easily, taking much smaller steps proved much more difficult in the 2011 budget. The political argument for frontloading thus strikes me as fairly strong. So does the political argument for focusing on spending cuts initially. Targeted spending cuts are typically more costly politically than general tax increases; thus it may be better to keep those tax increases in reserve for later, if and when fatigue is settling in. If my list is about right, one cannot avoid the question of how many of these conditions apply to Europe’s southern periphery countries. The sad truth is that many of these conditions are not satisfied elsewhere. True, the adjustments that these countries have to make are smaller than those Latvia had to make. But their economies are less flexible and less open. They have less obvious potential gains in productivity, at least in the tradeables sector. They had much higher public debt to start. So, the lessons are not easily exportable. And we should be under no illusion that the adjustment in the south will be difficult and painful. In that context, the argument for a social pact, and faster joint adjustment of wages and prices than implied by market mechanisms and the downward pressure from unemployment, remains, in my mind, a very strong one. Åslund, Anders and Valdis Dombrovskis (2011) How Latvia Came through the Financial Crisis, Peterson Institute for International Economics, May. Griffiths, Mark (2012), “Latvia Beat the Odds—But the Battle Is Far From Over”, iMFdirect, 1 June. Krugman, Paul (2012) “Latvian competitiveness”, krugman.blogs.nytimes.com, 10 June. Wren-Lewis, Simon (2012), What is it about Latvia?, mainly macro, 9 June.